In the three decades since first meeting in an electronics shop, Pet Shop Boys’ have become so integral to British music history they recently found themselves, possibly with some irony, sharing a stage with Rock Aristocracy like the Who and Queen at the recent Olympics closing ceremony. Granted they were still wearing pointy hats and riding a chariot. 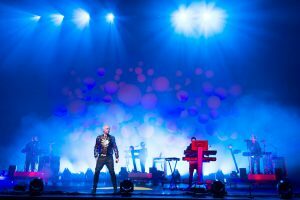 But Neil Tennant and Chris Lowe find themselves in a significantly-changed musical landscape to that in which they initially started out. A dizzying world of social media, digital marketing, product portfolios and instant-fix, access-all-areas celebrity. How does a band famed for razorsharp wit, heartbreaking pathos, and—yes—reluctance and contrariness (such as amusingly elongated single titles 1999’s “I Don’t Know What You Want But I Can’t Give It Anymore”) survive in the ‘more! More! MORE!’ Popworld of 2012? PopMatters met with PSB vocalist Neil Tennant to discuss the bands’ eleventh album, Elysium. A reflective but regal, lush-sounding record in stark contrast to much of the snappy uberpop of 2009’s Yes. The new album found the duo recording again in the US, almost thirty-years after first crossing the Atlantic to record the original version of their chart-topping hit “West End Girls” with Flirts’ producer Bobby O. This time they relocated to sunny Los Angeles with perhaps surprisingly, Grammy-decorated producer Andrew Dawson, who is more noted for working with R&B and rap superstars like Kanye West, Beyoncé, and Lil’ Wayne. Well Neil did once half-jokingly suggest “West End Girls” was the first US Rap #1 single. But at least we could be certain the recent explosion of electronic dance music across America and the fall of ‘Rock & Roll’ would make this enigmatic twosome raise a toast of approval? Maybe even do a little victory dance? Mmm, think again. Greetings Neil it is a pleasure to talk to you! The last time we saw Pet Shop Boys you were riding chariots and singing “West End Girls” to “quite a few” people at the Olympics closing ceremony. How scary slash surreal was it? How did it rank on the scale of bizarre things you’ve been asked to do in the name of pop? It wasn’t as scary as I thought it was going to be. We rehearsed it in the afternoon. I was worried that a wheel might fall off the chariot and I would go tumbling infront of billions of viewers [laughs]. So on the scary rating it was about five-out-of-ten and the bizarreness…of course we don’t find that bizarre doing that, so one-out-of-ten for the bizarreness. We hadn’t worn the pointy hats for a long time, but when we went for a meeting with the Olympics they had a little model of us wearing pointy hats and they looked so cute we decided we’d wear them again. Those chariots seemed to be crackin’ a fair ol’ pace did they have to strap you in? No! It was quite cleverly done. We had a little back rest and so we just leant against it. When we first went on them in the first rehearsal I was sort of clinging on because it seemed rather unsafe but it felt pretty smooth so we just leant back and put your weight on the rest. We didn’t have to hang on to the sides which would’ve looked very uncool. Do you think the opening and closing ceremony captured the legacy of British pop well? Any unforgivable omissions? It was a genuinely atmospheric, time-stands-still moment that really caught the audience’s attention..
Yeah I think there was meant to be a video during it but it got pulled or something. It was the same designer! Es Devlin. I think she had to come out with this very quick solution because of the video not showing up. At the rehearsals she actually texted me “Did you see the Pandemonium tribute?” and I didn’t know what she was talking about but on the night watching on the telly backstage I was like “Oh that’s what she meant!” [laughs]. Some people had a grump about George Michael getting playing two songs though—particularly his new single? I’m not surprised some people had a grump about it. He was the only person who insisted on doing his new single. We were very proud to be invited and kind of “representing British pop” or something. Did you get to see any of the Olympics itself? After all the hype and to borrow a Pet Shop Boys title “Was it worth it”? [laughs] Well of course I’m not that into sport really. I watched the round-up on the telly in the evening. The only thing we watched was when Chris and I were doing press in Cologne was when Tom Daley was diving for the first time. But then we had to turn it off because it was too distracting [laughs]. So we more-or-less watched that happen live. Chris watched more of it than I did. I think he even went to see something a couple of things. So you have your 11th studio album Elysium and you’ve used both a new producer Andrew Dawson and recorded in Los Angeles for the first time. Was there a particular sound you were aiming for? Yeah we’ve just been intrigued for a while about this influence of European electronic music on hip hop which is totally logical if you go back thirty-odd years and see where it started with Kraftwerk and “Planet Rock”. I really liked Kanye West’s album 808s and Heartbreak particularly the first track (“Say You Will”). When we were writing the song “Invisible” it somehow made we think of that album. We just wondered what it would be like to work in LA and get more of a ‘luxurious’ sound but also to get someone who had worked on Kanye’s album to ‘balance up’ the sound. They do it in a totally different way than an Engineer or Producer would do in Britain. We saw Andrew Dawson’s name all over these albums and he’d also worked on Drake’s album (“Thank Me Later”) which again is a great electronic album. Also on a practical level we wanted lots of backing singers and we knew we’d get amazingly ‘smooth’ backing singers in LA. We also wanted the music to have a bit more ‘space’ like hip-hop does, contrasting our last album Yes which had that fantastic ‘crammed’ pop sound. Xenomania. As ever with us we tend to react to our own last album and I think there’s probably some of that going on here. It’s a very ‘beautiful’ sounding record as a whole. Thankyou that was really what we set out to do, make a “beautiful” sounding record. Chris wanted to have a ‘one mood’ record and we even went in to the first producing with Andrew and he had all the songs we’d written. We had 25 songs including some very strange things we’d written last year [laughs] which we were almost embarrassed he had. But then Andrew said “No, you should have “Winner”, “Face Like That”” and actually I was kind of bit worried about “one mood” anyway. What was the “one mood” Chris originally wanted for the album? The mood of “Leaving”, “Invisible”, “Everything Means Something”, the “late night” mood. More selective! Were all the songs written before you went to LA? Oh God the songs were written as we do a lot of work on the tracks before we even go into the studio with a producer. What we really look for in a producer is to take what we’ve done—which is a lot, endless tracks of stuff—and make it sound better. Maybe pare it down a bit which is what Andrew did he actually simplified the sound. He’s great on sub-bass. He really worked hard on the sound which is where we can bit a little lazy sometimes. The Kanye West song “Runaway” in particular, that gorgeous piano-led song, has that introspective melancholy Pet Shop Boys do so well. A lot of your fans though might think LA was the antithesis of Pet Shop Boys. You once hilariously compared it to Milton Keynes (in the book Pet Shop Boys Versus America). Did you enjoy your stay there more this time? [laughs] Funnily enough I quite like Milton Keynes! Chris and I went to see Eminem play there a few years ago and I’d never actually been there before and I quite liked the ‘Garden City’ idea even though some people say it doesn’t really work. I think they may have a clichéd idea of a) LA and b) Pet Shop Boys. Y’know back in the 80’s Los Angeles was the backbone of the Pet Shop Boys’ USA fanbase. All these little blonde kids who used to like us, New Order, the Cure and Depeche Mode of course being the number one. So we actually have fond memories of it but I didn’t really know it. I just knew a bit of Sunset Strip which is where we normally stayed and I’d always found it actually quite scary. There’s a Gothic, strange side to LA which people write songs about, “Dreams being washed up” and all the rest. You can feel that when you’re there. This was the first time geographically it made sense to me. I started to know where places were. We would be driving around and we rented a ‘bungalow’ above Beverly Hills with amazing views of the city below us twinkling away. I got to feel quite used to it. The title Elysium itself refers to either a state of blissful happiness or a celestial Valhalla afterworld for the heroic and brave. There’s a real feeling of ‘mortality’ on the record but with a sense of serenity and renewed ‘carpe diem’. Is this Pet Shop Boys saying “It’s the end of the world as we know and I feel fine”? It’s the Pet Shop Boys appreciating or dwelling on their stage in their lives and the stage of the band with regards to the rest of the music world maybe. Realising you don’t live forever. My parents died in the last five years and so you think about death more. Martin Amis famously said that before the age of forty you don’t think about death and after the age of forty you don’t think about much else. I’ve always thought there’s was a lot of truth in that. So in this album it begins with a reference to death. Of course the Pet Shop Boys’ first ever hit “West End Girls” starts with “Sometimes you’re better off dead…”. There’s always been a lot of death and funerals in our songs. Elysium ends with a funeral of a friend of ours on “Requiem in Denim and Leopardskin” but it’s not bleak. In the past we might have been bleak about these things. The album title we stumbled upon by accident. There’s a park in downtown Los Angeles called Elysium Park and that’s where we got the idea. The “Elysium” we’re thinking of seems like a warm, fuzzy place. Also I think it’s quite a philosophical album and the title sounds quite philosophical. We didn’t want another Pet Shop Boys “Potentially” kind of title. The kind people assume we’re going to come up with and I think it suggests there’s going to be a different sort of sound or feeling too. The record ends with, is it a motorbike, driving off into the sunset? It is! It’s a Triumph Herald. I know nothing about motorbikes. It’s the ‘right’ motorbike. The song is about a make-up artist we used to work with and it’s about her funeral. She was into biking and bikers and always wore denim and leopardskin. During the funeral when it came to going into the Chapel the coffin came in on a motorcycle sidecar with a leather jacket over it, and a rose on top of the jacket. So at the end she goes off to Elysium presumably. That’s very ‘specific’ and Andrew Dawson found a friend of his who’s into motorbikes and he had the right Triumph motorcycle. Yet it’s certainly a cathartic feeling one takes from the record as a whole—it’s not ‘a downer’ album. I know it doesn’t sound like an ‘up’ pop record—it’s not a ‘banging’ record—but I think it has a very good feeling. I think Andrew helped us to get a very good feeling on the tracks. Its just got a sort of warmth which I thought we’d get in Los Angeles and we did. I’ve always loved the way you’d often describe the sound of Pet Shop Boys as “Tragi-disco”. That mix of elation and melancholia. Even “Winner”, which appears initially quite euphoric, has that double-edged sting “Enjoy it whilst it lasts”. Some people have said it’s triumphalist but it’s actually meant to be the opposite of that—anti-triumphalist [laughs]. It’s really about knowing the moment won’t last. It’s finding the failure in success! [laughs] It’s about enjoying the moment and we’ve had moments like that when “West End Girls” got to No1 and things like that. You know it’s not going to last so you’re kind of dealing with it and how it’s going to impact on you. Really it’s the old English cliché of it doesn’t matter if you’ve won or lost it’s how you play the game. That’s kind of what we’re like anyway. There’s always sadness in happiness and quite often vice versa. We’ve always had the ‘Crying at the Discotheque’ thing. I think it comes out of our personalities. Lyrics have always been a crucial part of Pet Shop Boys’ songs—whipsmart, heartbreaking and hilarious sometimes in the same song. Many op lyrics today are comparatively one-dimensional. “Ego Music” touches on the current trend of bratty pop stars kicking off their nappies and demanding to be the toppermost of the poppermost—Did you have anyone particular in mind when writing “Ego Music”? It’s more or less an entire generation I think! In a way what it’s really about is social media. Twitter. Facebook. There was an article which kind of influenced this in the Guardian newspaper about what I believe is called “Humble Bragging” where you say something like “OMG! Can’t believe someone just mistook me for Gwyneth Paltrow!” that kind of thing. Fake humility! Everyone’s got a Foundation nowadays haven’t they? They’re not writing “Running up that Hill” by Kate Bush! What I miss is poetry. I think poetry can exist in mainstream pop music. Even a group like Duran Duran were seeking a kind of poetry. “Wild Boys” of course was influenced by William Burroughs. You so don’t get that anymore. Very rarely. Ed Sheeran or whatever he’s called does these maudlin tales about someone who’s a drug addict or something. At least he’s imagining something. But there’s not a massive amount of poetry to it. When you think of an amazing record like “When Doves Cry”, or “19th Nervous Breakdown” by the Rolling Stones. Huge pop records with incredibly strange lyrics. People give away everything about themselves and there is no such thing as bad press. Yes and there’s also an assumption that they are interesting. I think it’s the work that’s meant to be interesting. Nowadays, it’s complicated, it’s a different thing. It’s one product range. You’ve got the clothes range, the perfume, charity, you make records, you’re a judge on a TV show. It’s a multi-faceted career nowadays. The music itself is just one of several products. The new track “Your Early Stuff”—“You’ve been around but you don’t look too rough”—Is this the Woody Allen Stardust Memories thing “I liked your early, funny stuff”? Are you frustrated by people’s perception of Pet Shop Boys? Well yes. The song is actually a compilation of remarks made to me by Taxi drivers. I live in London mainly so I go in taxis probably everyday. It’s really how I get around as I don’t have a car. They’re very chatty and they kind of assume you’re retired and you listen to Talk Radio and don’t listen to music anymore. It is frustrating. Pop music is meant to be a young person’s musical form so I appreciate it could appear strange that you’ve got guys in their fifties or indeed older making pop records. But I think we’re showing…or trying to prove that it can be done and be a totally logical, expressive form and that pop music is a vehicle for self-expression, poetry and philosophy. As it always was from the Sixties’ onward. People with the Pet Shop Boys want to think “How camp was that!” all that kind of thing. It is quite frustrating. Also they really just want you to be “Pet Shop Boys 1985 to 1988”. That can be a lazy journalistic attitude, that when you want to go and see someone “You want to hear the hits don’t you?”. Actually do you? If I went to see David Bowie in concert tomorrow I don’t require him to play…well I’d quite like him to play “Heroes” [laughs] but I don’t necessarily think he’s got to start with “Space Oddity” and plough through his greatest hits album. I’d quite like to hear “Joe and the Lion” from Heroes. I’d quite like to hear something from Outside. I think it’s a lazy attitude which is more prevalent with pop music than it would be than if you were a writer, although they get it too. Of course if you’re a visual artist and you’re any good, the trajectory is that you get better as you go along. But you don’t really get that in pop music. There’s always that assumption that your early stuff was good., “Oh I like their early stuff”. Yeah I mean Derek directed the whole show. Now of course it’s unbelievably common place to have a video behind you. So much so we’re thinking of not doing it anymore [laughs] ‘cause when you go and see them it’s “Ooh they’ve got a video playing behind”. On the last tour we tried with video to make it kind of interactive with people on the film and on stage at the same time. That’s why we’ve done the ballet (The Most Incredible Thing), the musical (Closer to Heaven) and Battleship Potemkin, we like putting music with visuals. There’s a massive hunger for electronic music in America at the minute—As one of Billboard’s all time most successful dance acts why do you think the US is finally embracing dance music and taking it seriously? Do you feel any kinship towards any particular acts? Wellll we call it ‘electronic music’. I mean it is ‘electronic music’ but it’s the sound of a Las Vegas pool party. A few years ago—we were playing Las Vegas actually—and we checked into our hotel and I couldn’t believe how noisy my room was! I looked out of the window and there was a full-on Las Vegas pool party in progress and they’re playing what is now called ‘EDM’. A sort of brutal pop music. Actually when we were last in Los Angeles we were listening to this radio station in the car called 96.3FM which is Los Angeles’ only ‘Spanglish’ radio station where the DJ speaks almost simultaneously in Spanish and English and they play lots of remixes and things. Really great Latino music, still dance music and some of that is EDM. I find a lot of EDM a bit mindless in not a particularly good way as I think ‘mindlessness’ requires a real talent in pop music. It is interesting though I realised I felt totally alien in the pop world—which is probably how it should be—when I looked at the chart the other week and thought we now live in a ‘featuring’ world. It’s just literally everyone’s ‘featuring’, Calvin Harris featuring Rihanna, David Guetta featuring y’know, etc. It’s quite an interesting phase in a way. But I realised we had no part in it and it made me feel slightly sad! [laughs] Its ‘feat.’ you’re right. Another big trend on Billboard at the moment is this massive British invasion—Adele, Mumford & Sons, One Direction, Florence, Jessie J—Is this a golden age in British pop? Is it tragic or revolutionary to see Cher Lloyd in the US top 20? I didn’t know Cher Lloyd was in the top 20!? Is the record any good? Cher Lloyd is X-Factor right? I watched the first of that series of X-Factor and I immediately said to a friend of mine who was there “They could stop the show now ‘cause she’s obviously the winner”. Of course she wasn’t the winner as it turns out! There’s been another British invasion which doesn’t really get reported and that is reality television. A few years ago we did Dancing with the Stars in the United States. It was the semi-final and it was watched by millions of people. Obviously we had to do “West End Girls” because that was the only song but we were puzzled why we were asked to do it and when we got there the entire crew was British! All of these formats are British and they’ve taken over the world and the pop stars seemed to have followed in their wake. But also the British pop stars have—the good ones—have a ‘freshness’ where the American ones always are more professional. The British ones are professional—I mean Jessie J and One Direction are pretty professional—but there’s a sort of ‘freshness’ that American stars don’t have. They have that sort of ‘Donny Osmond’-type professionalism. Some of it I don’t understand—Mumford and Sons being big in America? I think Adele’s album—the world needed an Adele album! I mean Adele’s album is not without poetry. Y’know the music industry is really defeatist. It’s really, really, really defeatist. It’s now trying to get rid of CD format even though it’s the format 70% of the people buy their music on. It’s a vastly more high quality format than mp3. Adele’s record is on an indie label isn’t it? XL? It just proves there’s a hunger out there for poetry and beauty. Some of it’s quite corny but it’s quite an extraordinary achievement to have the best-selling album in the world.